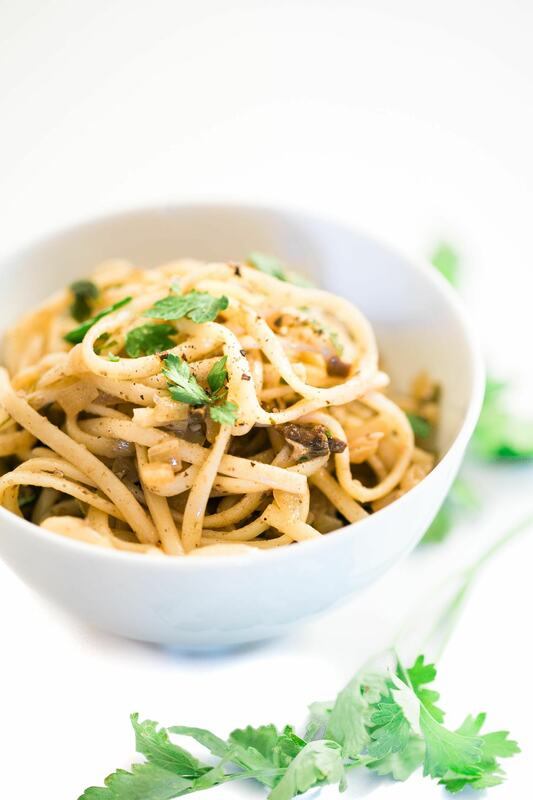 In addition to being delicious, what we love about this heavenly creation of linguine, Porcini mushrooms, truffle mushrooms, garlic & parsley is that it will be in your belly in less than 15 minutes. Oh yes, it’s also completely vegetarian and vegan. Talk about pasta perfetta! We absolutely adore a simple, flavorful, olive oil based pasta that can be prepared in moments while not compromising on taste. And we’re not short on company, either. 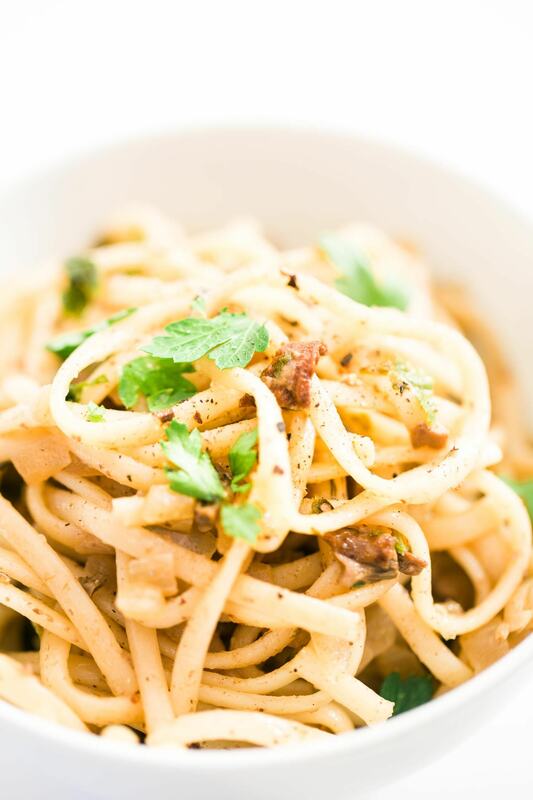 Aglio olio pastas (those based on garlic and olive oil) are a staple in Italian kitchens. The key lies in starting with a traditional Italian soffritto which builds the flavor from the bottom up. There is no complex process to follow, simply chop up the freshest base ingredients you have available and sautee them in olive oil. Today we’re using two onions, a handful of flat Italian parsley and three cloves of freshly minced garlic. We’ll be adding some porcini mushrooms (dried are the best for that extra savory, umami flavor boost) as well as a few tablespoons of “truffle cream” we found at the store. Yes, it’s true, using “truffle cream” or sauce is not the same as cooking with whole truffle mushrooms. But for those based outside of Europe, it’s a quick way for us to add something reminiscent of that coveted savory truffle taste to our humble meals. ? Next go ahead and chop your onions finely. Add them to a large saucepan with five or six tablespoons of your best olive oil, and allow to saute over a medium heat. When creating olive oil based pastas, you want to use a really high quality extra virgin olive oil because this is the base of your meal. The stuff you wouldn’t feel embarrassed serving to one of your Italian foodie friends. Remember, the better the olive oil, the better better the final result will be. Don’t be afraid to put the good stuff into your cart next time you head to the store. It’s okay to #treatyoself – you’ve earned it. ? Watch your heat now, and keep stirring the garlic so that it does not burn or turn too dark in color. The pungent taste of dark garlic will easily overpower this subtle melange of flavors. Now we add the porcini mushrooms, finely chopped to the olive oil mixture. Reserve the soaking water, of which you can add 1/3 of a cup to the olive oil mixture. You may also wish to add two to three optional tablespoons of white wine. Allow the liquids to reduce until all the alcohol and porcini liquid has evaporated. Add salt and a few grindings of black pepper. Finally, stir in three or four tablespoons of truffle cream sauce bought from your local Italian delicatessen. Taste the mixture at this point, and correct to your liking. When the linguine is al dente (cooked, but still somewhat firm when you bite), remove it from the pot of water. Reserve one third of a cup of pasta water, and add this, with the linguine to the saucepan of olive oil. Toss rapidly using two forks, allowing the mixture to coat the pasta, fully absorbing the flavors of the porcini, truffle sauce and soffritto. Remove from heat, sprinkle in the last bit of fresh parsley as garnish, toss again and serve while its hot! Super tasty, Italian style Linguine pasta recipe with Porcini Mushrooms, truffles, garlic and fresh parsley. Vegan and Vegetarian. Ready in 15 minutes. Bellissima! Put pasta on the boil. Chop parsley, adding it to the olive oil mixture next. Save a little parsley for fresh garnish. Chop garlic and add to the mix, watching the heat so that it does not burn or turn too dark in color. At this point you can two to three optional tablespoons of white wine. Allow to wine and mushroom liquid to reduce until all the alcohol and porcini liquid has evaporated. Add salt and a few grindings of black pepper. Stir in three or four tablespoons of truffle cream sauce bought from your local Italian delicatessen. Taste the mixture at this point, and correct to your liking. When the linguine is al dente , drain it in a colander, reserving one cup of pasta water. Add ⅓ of the pasta water, along with the linguine to the saucepan of olive oil. Toss rapidly for a minute or two using two forks. Allow the mixture to coat the pasta, fully. Remove from heat, sprinkle in the last bit of fresh parsley as garlic, and serve while its hot!